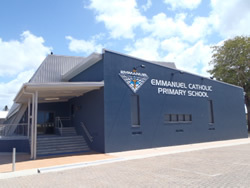 Emmanuel Catholic Primary School began life as Emmanuel Catholic School in 1983. It was extended to become the first P-10 School in the St. Joseph’s Parish, with the purpose of providing increased access to Catholic families on the rapidly developing northern side of the river. As development in the area continued, and the school grew to 900 students, the Visiting Team for the 1994 School Renewal recommended that Emmanuel College be separated into a Primary School and a Secondary College sharing a campus. By 1996 Emmanuel Catholic Primary School and Holy Spirit College were established as two separately administered and staffed schools. Emmanuel Catholic Primary School is now one of four Catholic Primary Schools in St. Joseph’s Parish, along with MacKillop Catholic Primary School at Andergrove, St. Joseph’s Catholic Primary School at North Mackay, and St. Brendan's Catholic Primary School at Northern Beaches. Year six students from these schools continue their education at Holy Spirit College. The founding Principal, Sr. Joan McBride was a member of the Marist Order, and as such brought a great tradition of faith, care and concern to the school, a tradition which is remembered and nurtured today. Sr. Joan joins Bishop Bernard Wallace, the late Bishop of the Rockhampton Diocese, Rev Dr Kevin Castles past Director of the Catholic Education Office, and Fr. Joe Carroll past priest of St. Joseph’s Parish, as founders of Emmanuel. Their contribution to our school is perpetuated in the four Pastoral Care Houses to which the student body belongs - McBride House, Wallace House, Castles House, Carroll House.